DISCLOSURE: I received a free copy of this book from NetGalley and Crown Publishing in exchange for an honest review. A couple weeks ago, I read To Rise Again at a Decent Hour, a book narrated by a slightly neurotic, perhaps unreliable dentist. This week, I read Herman Koch’s Summer House with Swimming Pool, a book narrated by a slightly sociopathic, perhaps unreliable doctor. Needless to say, this string of books has left me speculating as to the internal monologues of my seemingly friendly and caring medical professionals. If these books are any indication of the inner machinations of my doctors or dentist, then ignorance really is bliss . . .
Human bodies are horrible enough as it is, even with their clothes on. I don’t want to see them, those parts where the sun never shines. Not the folds of fat in which it is always too warm and the bacteria have free rein, not the fungal growths and infections between the toes, beneath the nails, not the fingers that scratch here, the fingers that rub there until it starts to bleed . . . Here, Doctor, here’s where it itches really badly . . . No I don’t want to see. I pretend to look, but I’m thinking about something else. He is disgusted that his patients “aren’t content with his years of experience, his clinical gaze that registers at a single glance what’s wrong with a person.” He hates that “[t]hey want the doctor to poke at them at least; they want him to pull on his rubber gloves and take something—some body part—between his knowing fingers. For him to stick at least one finger into something.” But he gives them each twenty minutes, because that will keep them coming back. Thanks to word-of-mouth, Marc’s practice is largely populated by second-rate artists and actors (he has a reputation for liberally doling out pills). Due to his clientele, he is regularly invited to gallery openings, movie premiers, and book launches, all of which he finds horrible and inane. But when his new patient, Ralph Meier, invites him to the opening night of Richard II, Marc and his beautiful wife, Caroline, decide to go. Ralph is a large, somewhat lecherous man with a lot of presence. And, despite the fact that Ralph leers hungrily at Caroline upon meeting her after the show, there’s something about Ralph (and his lovely wife, Judith) to which Marc is drawn. Ralph and Judith have rented a house near the ocean for the summer (with their two teenage sons, Judith’s mother, a famous director who is working on a new HBO show with Ralph, and the director’s much younger model girlfriend), and they invite Marc and Caroline and their two teenage daughters to join them. Despite having some misgivings, Marc and Caroline end up uncharacteristically accepting the Meiers’ invitation. Their days at the summer house are spent eating fresh seafood, drinking wine, playing ping pong, going on adventures to remote beaches, and hanging out at the pool. Marc is largely preoccupied by the various sexual undertones and energies (between the Schlossers’ eldest daughter and the Meiers’ eldest son, Judith and Marc, the director and his girlfriend, Ralph and every attractive woman he sees . . .). But then, one evening, something terrible happens. It is a crime that sends Marc reeling. He suspects lots of people, but mostly Ralph, and Marc’s suspicions induce him to act in questionable ways. Koch is a Dutch author whose last novel, the psychological thriller The Dinner , was an international bestseller that was translated into twenty-one languages. With The Dinner, Koch established himself as a pro at delving below the polite surface and shedding light on all of the creepy, complicated psychological motivations that underscore people’s interactions and decisions. Summer House with Swimming Pool is more of the same. Early in the book, we find out that Ralph has died (by euthanasia after an unpleasant bout of cancer). The rest of the book describes the events leading up to Ralph’s death and Marc’s involvement (Reasonable? Justifiable?) in those events. A man came walking down the path. He was wearing red shorts. Not normal shorts or Bermudas, but a design that left his white legs bared almost all the way up to his crotch. With every step he took, the wooden clogs he wore slapped with audible pleasure against the undoubtedly snow-white soles of his feet. In his right hand, right out in the open, for all to see, he was carrying a roll of toilet paper. It was a feeling, nothing more. A loathing. It felt loathsome to me, the fact that this man could be walking only a few steps away from my daughter and her tricycle. I saw Julia stop pedaling for a moment and look up at him. That made it even more loathsome. The idea that my daughter’s barely three-year-old eyes were taking in this far-too-white and exposed human body. It was—I don’t know how else to put it—a befoulment. The man was befouling our view with his bare legs, his wooden clogs, and his loathsome white feet. In small doses, this kind of acerbic rant is clever and funny and perceptive . . . but read nearly 400 pages of it, and it just seems like too much grumpy, obsessive cattiness from a grown man. It doesn’t take long for it to get old and tiresome. Koch does a great job of crafting a consistent (albeit consistently unlikable) and distinct character and voice. Marc isn’t a nice guy, he makes some bad choices, and he does some icky things. Unfortunately, it’s all Marc, all the time. There aren’t any lovely, wonderful, likable characters to counterbalance Marc’s deplorability. That said, if you’re drawn to morally-questionable jerks, then this book should be right up your alley. One of New York Post’s 29 Best Books of the Summer. Who should read it: Fans of The Dinner (i.e., people who like both character-driven novels and psychological thrillers). 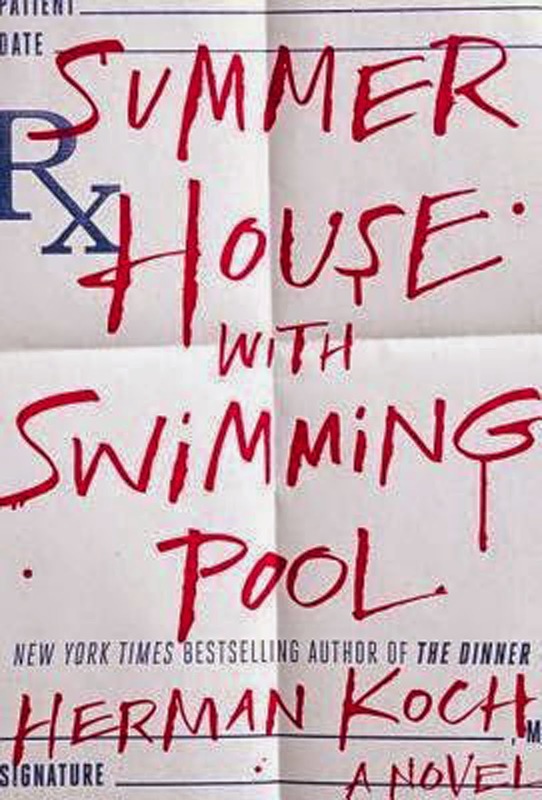 This entry was posted in Rating: 3/5 and tagged Book review, Book Reviews, Books, Crown Publishing, Herman Koch, Net Galley, NetGalley, Summer House with Swimming Pool. Bookmark the permalink. Beautiful review. I love your use of language, particularly the words “acerbic rant” and dealing with it over 400 pages. Personally, I was debating between reading this and Good Suicides, I went with the latter, but may come back to this. Thanks for the review! Thanks so much, Ryan! Glad you enjoyed the review. I will check out your review of Good Suicides! Great review! I am definitely going to read this one! Let me know what you think of it! I definitely think you’d like Boy, Snow, Bird (https://iknowwhatyoushouldread.wordpress.com/2014/06/09/boy-snow-bird/), too, so check that one out.